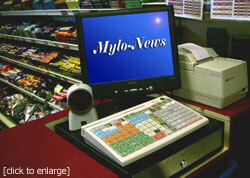 Mylo-Tek supply multi-purpose modular newsagent CTN systems based on state-of-the-art PC technology offering optional specifications (at low prices compared with other HND EPOS systems). Tremendous opportunities to expand and tailor the system to suit your own preferences and personal requirements. Mylo-Tek also specialises in the maintenance, support & upgrade of news computer systems supplied by Halo International Systems Ltd.
We believe that we have the most continual experience and association with computer systems for the Newsagent CTN trade dating back to the early 1980�s. Need more convincing? Forget the Customer �quotes�. Get the real information and speak direct to a wide spectrum of Customers (many that have used news computer systems since the 1980�s) that have benefited from transferring to the services & systems of Mylo-Tek.